As someone who is constantly fulfilling his sweet tooth, it’s no surprise that I was excited to write about cakes. As I’ve learned more about different styles, icing options and flavors, I see exactly why couples can get into a quandary when deciding on their wedding cake. Luckily for you, Team MAE has you covered in all things cakes; from french-inspired pastries to ganache frosting, there’s something to satisfy the pickiest of palettes! Traditional: Consisting of tiers, the traditional wedding cake stacks layers of cake on top of each other. If you like variety, each tier can be customized to a different flavor and filling. White cake tends to be the most popular choice, but when it comes to your wedding, it should be all about balancing popularity with the couple's personality. Groom’s Cake: An English tradition originating from the Victorian Era, the Groom’s Cake is commonly found in present day American weddings. This cake is often a gift for the groom and represents a favorite sports team, a hobby, alma mater or occupation. Croquembouche: This dessert is typically seen at French and Italian weddings. Croquembouche translates as “[something that] crunches in the mouth.” The dessert is created by adding pastries with a caramel drizzle to a cone. This cake is very opulent and ornately decorated with sugared almonds, chocolates, macarons and even edible flowers. Macaron Tower: Another au courant French-inspired dessert is the macaron tower. Macarons are a sweet meringue-based confection created by combining egg whites, icing sugar, granulated sugar, almond powder, natural flavors and food coloring. These delectable treats come in a variety of options that will be sure to make your guests happy. A fabulous gluten-free delight! Our favorite macarons in the city right now can be found at Vanille Patisserie (Vanille's Lavender + Rose 'Rons = Heaven)! Cake Ball Cakes: One of our favorite trends right now is the cake ball cake; instead of a cake slice, guests bite into a delicious cake ball! The ball doesn’t have the same consistency of a regular baked cake as it is combined with a frosting when molded. Dessert Tables: Want to surprise guests at your reception? Consider unveiling a dessert bar that features all of your favorite guilty indulgences in one place. Think beyond the standard the chocolate fountain with a s’more station, assorted cheesecakes and pies, petit fours, assorted berries & whipped cream, candy stations, cookies, brownies, popcorn, chocolates, etc. MAE’s Tip: Always be forward with your budget. The average cost of a wedding cake is between $445 - $631 according to Wedding Stats. “People are shocked at how expensive cakes can be, especially when they are fondant covered or a bit more complex,” explains Head Cake Decorator, Samantha Turner of West Town Bakery. If you’re balling on a budget, ask your baker to supply a beautiful faux cake with only the very top tier as the real deal to share with your sweetheart. A delicious yet cost-friendly, sheet cake can be sliced behind the scenes for your guests. It’s a great way to have the best of both worlds! The cake on your wedding day should be as tasteful as the day itself. Couples who would like to parlay their wedding theme onto their cake have countless options in styles these days. As for cake flavors, the sky is the limit in our culinary-crazed culture. 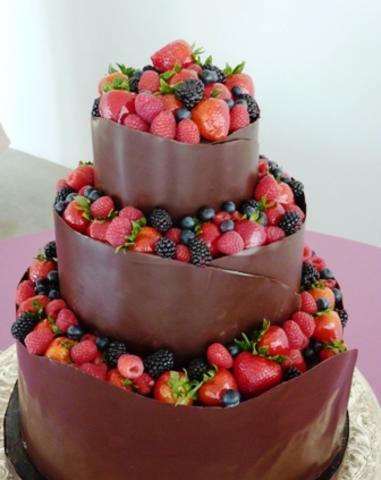 Ever After Guide created a list of 20 best flavors for wedding cakes. As you know by now, Team MAE follows the rule of “At Least Three.” Have your planner connect you with three bakeries that suit your tastebuds and budget. Tastings with your potential baker are a tremendous help in narrowing down your decision Consultation prices vary from baker to baker. Be sure to ask when you schedule your appointment. Alleviating clients fast-paced and demanding schedules, it is becoming common for bakers to send you home with samples to try on your own time. This relaxed trend does not rush couples to make a decision and gives them ample time to choose what suits them best in the comfort of their own home, says Emily Nejad of Bon Vivant Cakes. 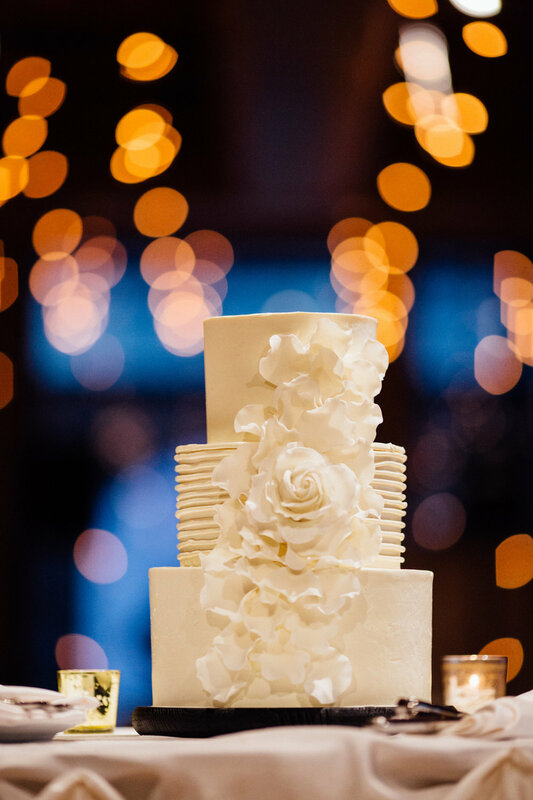 Regardless of what consultation style suits your needs, be savvy about the decision-making process and begin your cake search at least six months in advance of your wedding. MAE'S Tip: A full stomach going into your cake tasting can leave you unimpressed and heading for the hills. Have some light snacks beforehand so you’re not starving but also not full. Taste each item separately while you and your future spouse jot notes down about the flavors. Trust us, you will forget samplings if you spread out your tastings. Drink plenty of water so you have a clean palate for every new flavor. If you are deciding among several bakers, try to not taste everything in the same day otherwise you will likely be over-sugared and over it! You will be amazed at the different types of frosting you can have on your cake. From buttercream to marzipan, there are several avenues to satisfy your sweet tooth! Buttercream: This is the MOST popular frosting choice for wedding cakes. The combination of powdered sugar and butter create a smooth, creamy texture that makes the frosting a versatile piece. Bakers can shape the frosting as they see fit for the design. Buttercream can melt quickly so it’s best to keep the cake in a cool environment before indulging. Fondant: Mixing sugar, corn syrup and gelatin create the smooth sheet that is fondant. This icing is another popular choice among wedding attendees with its candy-like flavor. Fondant can withstand warm temperatures and can easily mold to form embellishments on the cake. The chewy texture is not always delightful for everyone's taste buds but is easily fixed by adding a buttercream frosting underneath. Marzipan: Marzipan is similar to fondant as it can be draped over the cakes. The difference between the two is that marzipan is created by adding a almond paste to the recipe. The paste gives the sheet more pliability when adding it to the cake. Ganache: Ganache is perfect for chocolate lovers. Cream is poured over dark semi-sweet chocolate to create this frosting for a glossy look. The color cannot be changed but couples can ask their baker to frost the cake with whipped cream if they would like extra adornment. Meringue: Combining egg whites with sugar over heat creates this billowy look. The frosting is ready in seven minutes with continuous stirring. Meringue is able to hold the shape because of the heating element. To make sure the cake is Instagram-worthy, it’s best to serve the meringue right away as it can spoil within minutes. Royal: Many of the intricate details you see on wedding cakes are created by royal icing. Beating egg whites with sugar creates this type of icing. It hardens quickly when exposed to air so bakers tend to work fast when applying the icing to cakes. MAE’s Tip: It is not uncommon for bakers to be icing-specific, only working with one type of frosting. Be sure to discuss their speciality in preliminary conversations especially if you have your heart set on one type of treat! 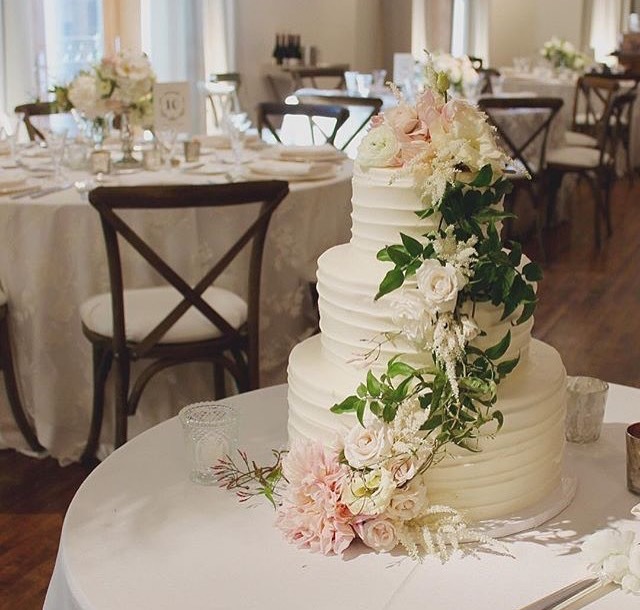 Contact the team at Marquette Avenue Events for assistance in finding your perfect cake combination and to help plan your Big Day! Find us at www.marquetteavenueevents.com or feel free to call us at 312-585-7265.